It’s Inde­pen­dence Day today in the U.S. of A.! That usu­al­ly means time off, doing fun things like pic­nics or bar­be­cues with friends, pos­si­bly tak­ing in a fire­works show (depend­ing on where you live), and maybe hope­ful­ly even giv­ing a thought to some of the free­doms we’re priv­i­leged to enjoy in this coun­try, which we can some­times take for grant­ed. This post is most­ly moti­vat­ed by the fact that real­iz­ing the hol­i­day was com­ing up, I had an image pop into my mind appro­pri­ate for the day, so I thought I’d go for it! As not­ed there, the char­ac­ter is Miss Fire­crack­er from Big Bang Comics, though she’s depict­ed here in a dif­fer­ent style from how she ever appeared in Big Bang. This is a good oppor­tu­ni­ty to talk about Big Bang Comics a lit­tle bit. Some peo­ple read­ing this may know that I was a con­trib­u­tor to Big Bang through its most active years. Though I can’t claim to have been there from the absolute very begin­ning, I did get in pret­ty ear­ly on. The char­ac­ter I had the most involve­ment in shap­ing would’ve been the Badge. But thanks to Big Bang hon­chos Gary Carl­son and Chris Eck­er, I got the chance to get my hands into a whole lot more than that. Not only did I get to draw a num­ber of oth­er Big Bang char­ac­ters (par­tic­u­lar­ly on fake com­ic cov­ers as seen in “The Big Bang His­to­ry of Comics” issues of Big Bang Comics), I got to design sev­er­al oth­er char­ac­ters, cre­ate logos, even kib­itz on some sto­ry­lines, ink and col­or. The way I looked at Big Bang, it was sort of “comics his­to­ry through a fun­house mir­ror.” You got to cre­ate things that felt famil­iar, yet new at the same time. It was a real­ly fun ride, guys! Thanks much! I’ve got anoth­er post already in the pipeline that I hope to be able to pull the trig­ger on soon, but that’s it for this one. 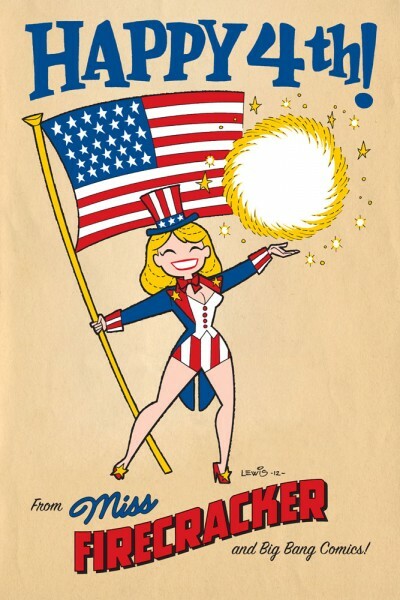 Have a great 4th, every­one! This entry was posted in Comics, Personal and tagged Big Bang Comics, Experiment, retro. Bookmark the permalink.